Quick overview Using extensive research based on empirical evidence, this title provides the reader with practical and simple guidelines, exercises and tips to improve performance, including: advice on the use of classical rhetoric; how to write a speech when in a rush; the myths surrounding visual aids; the use of body language; and more. The past twenty years has seen the emergence of an industry standard model of presentation - the slide show. Yet research has shown that audiences are deeply dissatisfied with this mode of public speaking. 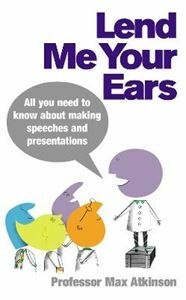 In Lend Me Your Ears, Max Atkinson - a highly experienced speaker and trainer, having been involved in speech writing for business, politics and the arts for 30 years - uses the findings of recent scientific research combined with the rules of classical rhetoric to highlight the secrets of successful persuasion. Using extensive research based on empirical evidence, Max has developed a new and provocative way of looking at speech making, providing the reader with practical and simple guidelines, exercises and tips to improve performance, including:--advice on the use of classical rhetoric--how to write a speech when in a rush--the myths surrounding visual aids --the use of body language. And much more! With expert advice that will appeal to everyone from experienced CEOs to those writing that all-important wedding speech, this is destined to be the definitive text in this area.